Confession: I never read that book. You may be tempted to stop reading right here. Perhaps you are terrified of public speaking. Before I tell you how to overcome this fear, know this: you are in good company. Liam Neeson, on finding out he lost the Oscar for Best Actor to Tom Hanks, said he felt “10% disappointment, 90% relief.” Imagine. A guy who makes a living by speaking in front of the camera is terrified by the thought of giving a public speech. Heck, even Gandhi himself – one of the greatest orators of all time – admitted speaking terrified him so deeply his vision would blur. learn to become a good speaker? Well, let’s put it this way. When Warren Buffett was 21 he realized he had two choices: face his fear of public speaking head on or never reach his potential. So … he enrolled in a Dale Carnegie course. Did it make a difference? 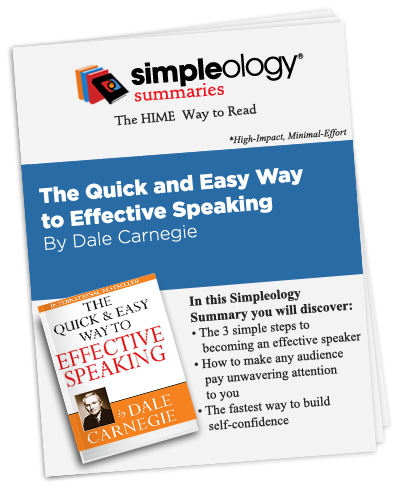 The contents of that course are in the classic Dale Carnegie book The Quick and Easy Way to Effective Speaking which we have conveniently summarized for you below. That book is 1/2 of what got me to where I am as a public speaker. It changed the course of my life as well. But, again, this is only half of what got me to the point where I can speak impromptu in front of an audience of any size with zero fear.